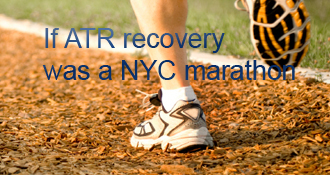 bdelputte has completed the grueling 26.2 ATR miles to full recovery! It’s 13 weeks since my rupture and to my utter delight, my physio cleared me for rowing this week. I had done a few sessions one-legged ergometer training and had also done a short trip in a rowing boat - with the boat - just using one leg but i was cleared to start using both legs a few days ago. She is keen for me to start using the leg without restrictions but is at the same time warning me not to overdo it - given the rerupture risks. That is all very sensible advice obviously but it’s not always clear what it means. However, I don’t really care because it meant i went into a rowing boat and starting rowing. First time felt really weird and I could feel the tightness in my leg so couldn’t use my legs optimally. However, i’ve been three times now and it works well. I use the achillotrain sock i purchased as it reduces the tightness. As to PT, my physio wants me to focus most on walking with normal gait and the goal is to walk barefooted without a limb. As I am having my big Canada rockies trip coming up in less than a month, she does not want to push an aggressive exercise regime on me as she does not want to take any risk that I somehow injure myself. Walking properly works a lot better if I have started the day with some good exercise. I posted last time about my experience with swimming but felt a similar reaction today after starting the day with the rowing session. My leg was noticeably less swollen for the rest of the day. I did get some heel pain in the afternoon but a compression sleeve worked well here. I am also capturing my walking with some videos and compared my walk today with the video taken a month ago. Oh my, what a difference a month makes. Especially when you are wondering if you are progressing fast enough, t’s definitely worth looking back at where you were just a few weeks back and you’ll see how far you’ve come. I’m 11 weeks post rupture now - I’ve been in shoes for 3 weeks and I feel like I’m slowly getting back to normal. I’ve been driving a car for two weeks now. Shortly after my last post (at 9 weeks) I felt I had been moving enough to try to use the car. It was definitely quite a shock to the system to push the brake and I felt very conscious the first couple of days - but once you get back to the hang of it, it feels very normal. I don’t drive long distances yet but did about two times 30 minutes drives today and no issues whatsoever. I also started swimming last week (10 weeks) - and I’d strongly recommend it to anyone! I was very cautious the first time i had to walk in a wet area and get myself in the water. The first strokes felt so weird and I was astonished how weak the leg was that even a few breaststrokes felt unnatural. However, all the swelling which had accumulated after a day at work disappeared after 40 minutes in the pool. I went for my third swim session today and could feel a massive difference in strength - and many laps without a problem (only breaststroke though - crawl stroke hurts my AT). Surprisingly - my ankle has been less swollen today - which i suspect is due to the morning swim. I can’t really explain it - but it just works for me. I went to see my physio for the first time this week and was a bit disappointed as she clearly is taking a conservative approach. No rowing whatsoever until July - no squats(!) - I didn’t tell her i had already started!! I don’t think she is particularly experienced in AT ruptures as she seemed very surprised that I didn’t have surgery and also suggested that my limp was a mental issue…. I mentioned I thought it was due to the fact that I couldn’t stand on my toes but she said it was something else… I have only lived in Denmark for 3 years and am new to the healthcare system here. Given that everything is free and works - and people are quite fuss free - i am kind of going with the flow. However, I may get a private physio if I am not getting over the impression that she is clueless re AT rehabilitation. I am so grateful for all the people who have uploaded great videos about their recovery - Agnes, you’re a star!! I’m 9 weeks post injury tomorrow and will have completed one week in shoes. I have mixed feelings - feeling very pleased that I can walk - albeit very slow and with a slight limb. I haven’t really used my crutches so the transition has been easy and I’ve only used the boot the first two days. I am now going everywhere in shoes and am even comfortable in flip flops (vionics were a worth every penny). On the other hand, I am again confronted with the fact that this injury takes a loooooong time to heal and that i still have major limitations. I knew this - from reading everyone’s blogs - however, you don’t really know until you experience it. I am already so fed up with the tight feeling in my leg when i wake up. However, the good news is that I can see progress every day. I am walking a lot (relatively) - and that helps a lot. Did 12,000 steps today and whilst there is some swelling to my leg - it isn’t massive and i’m not in pain. Frustratingly, my first PT appointment is only in 2 weeks and I have some standard exercises to do which don’t give me much (seated heel raises and exercise with the ball). As I’ve read many others saying how important walking is, I’ve decided to focus on getting a good walk every day. I’ve also invested in the Bauerfeld Achillotrain sleeve. Very expensive at about EUR 70 and the hospital told me not to use it too much as my leg needs to get used to getting around without support. However, i used it last night to go out and it really makes the walk easier - as it removes some of the tightness in the leg. I also used it to go to a playground last week (day 2 in shoes) and it made me feel more comfortable (although rest of my leg had swollen up quite a bit after 3 hours in the sleeve). I have to keep reminding myself of the dangerzone i am in - and that I really can’t overdo it the next few weeks. With my body and mind pushing me to take the next steps - I hope i can remain patient! I went for my 8 weeks check up today and as hoped and expected, my doctor told me I was ready to leave the boot behind and start to walk in shoes again. I had myself mentally prepared for this for the past week or so and had started to sleep without the boot and also carefully put my foot on the floor. As none of that hurt - i had been hopeful that everything was healing well and i was obviously very relieved to hear the doctors confirm that. Both my doctor and physiotherapist insisted that i should leave the boot and not use it again. Having read so many stories here - I told them i wanted to keep it - in case i needed it for transitioning. Walking is easier than i thought - it goes slow - and my physio told me i can’t take the same strides with both legs just yet as it puts to much pressure on the achilles. However, I am walking - in shoes - without crutches - so am thrilled with the progress. I am convinced that the three weeks of FWB in the booth have been very helpful to transition to this new stage of the shoes. Whilst i was walking slowly in the beginning - i was moving very confidently in the boot in the last week and my legs at least got used to moving around again. After two months with little exercise - i am dying to do some cardio training. That’s partly why i kept the boot - I’ll start the one-leg rowing this weekend. Here we are - five weeks in the boot and I am crutch free! My protocol allowed me to start full weight bearing after 4 weeks in the boot and I have tried most of last week to get there. I watched plenty of videos on you tube of how to get there but struggled a lot. I simply could not get myself to bear enough weight on the injured leg. Like many others, something just clicked yesterday and suddenly I was walking with just one crutch in a smooth way. I was so proud and excited that I could finally do that - and indeed, the simple joy of carrying your own cup of tea…. I took out the second wedge last night and was a bit worried I would not be able to continue my progress but to my own surprise, i just dropped the other crutch today as well and am now officially full weight bearing. For those who are struggling to get to that stage - i can only echo what other people have said. Be patient - it will come. What helped me eventually was doing some seated weight bearing - I started to put some weight on the foot whilst i was sitting - just to get a feeling of putting weight on. It helped me also to roll fully through the boot - from the heel all the ways to the toes and I felt the pressure on the toes (without it hurting). As always - grateful for all the input and info from the other people on this blog- It really helps! When can i start rowing again? I am a keen rower and with our lakes here in Copenhagen finally being ice-free, I am gutted that I am missing the start of the season. However, it seems like indoor rowing is one of the first training activities people can take up again and I’ve seen people posting about rowing with one leg off the machine - or rowing with the boot on etc. I have not started PT yet but when I was in the hospital just after I got my boot - they told me I could start probably after 8 weeks provided I didn’t do it properly (ie mainly using upper body). I’d love to hear other’s experiences with rowing. I want to start using the rowing machines as soon as possible with the ultimate aim to get as soon as possible back in a boat on the lakes. I ruptured my achilles tendon 4 weeks ago. I was at a party and after 3 hours of dancing, during which i had kicked off my shoes, i felt like someone had kicked me really hard in the leg (at some point when we were jumping up and down like crazy). I managed to make my way home in a taxi - iced the leg for a bit - and managed to make my way to bed. I went to the emergency room the next morning where they confirmed that I had fully ruptured my achilles tendon. I opted for the conservative method and was given the romWalker boot and crutches. I was told to do non-weight bearing for the first four weeks and then progress to full weight bearing after that, whilst also removing a wedge in the boot, every week. However, I am now trying to start to walk with just one crutch but am find it very difficult to have any kind of normal walking pattern. Instead, I find myself limping and barely manage to get the good leg next to the injured one. Any tips on how I can ditch the crutches - whilst maintaining a kind of normal gait? Wow! It’s wonderful to read about your progress. Glad that each swim has brought more strength, reduction of swelling, and joy. I also appreciate hearing about the caution you exercised getting into the water! I am one week post-surgery and preparing soon to start “moving about the cabin” more — nwb for 4 weeks is the current plan, so the issue of how to take care but not be shut down by fear is lively! Your PT person sounds pretty clueless to me. You are probably limping because your taking too big a stride. Take smaller steps - as small as you need to walk normally without a limp. The achilles can’t stretch as much right now so you have to take smaller steps. As it heals and your PT improves it’s flexibility you can take longer strides. Agnes talked about it in her blog. And, as you walk/move more the swelling will decrease since the natural pumping action that happens when you walk helps pump all the fluids around so they don’t pool in your foot/ankle. You should definitely be able to do rowing with one foot - again flexibility is what will limit your ability to use the ATR foot. You have to flex the strapped in foot quite a bit when you row and it takes a while for your injured achilles to get that flexibility back. Wondering which vionics you purchased? Been there myself some 6-7 weeks ago - I am now on week 16. I started going to the gym and swimming pool at week 9 or 10. It’s very individual, by just see how it goes for you. I actually never had a single PT session and have been doing stretching exercises - with resistance bands - every morning since then. I am now down to 1 wedge (removed last night) and I can feel that there is more pressure on the heel - which is a bit sensitive. I bought one of those ‘even ups’ as it really helps to have your hips not out of control. how many wedges do you have in at 5 weeks? i’m in the aircast and still have it at 20 degrees and have the rocker sole on. i can walk without crutches but it isn’t smooth as the heel on the boot is so awkward. i’m 4w4d post surgery. I started rowing with just one foot on at the gym at 4 weeks after surgery. My doc insisted on 3 weeks of elevation at least 90% of the time and after that I took another week to get used to moving around a lot more and then started hitting the gym to do one footed or seated exercises. While you’re in the boot it is impossible to have that foot on the rower since you can’t bend as much as you typically do on a rowing machine. Even after I was allowed to start PWB (and was allowed to remove the boot for exercises) my achilles did not have the flexibility I needed for quite a while on the rower so I was doing one footed rowing for many months. The key thing in the early stages is DON’T stress things as they heal. You can check out my blog (http://achillesblog.com/cserpent) in the early months where I describe the exercises I did at the gym and put links to a couple of YouTube videos for 1-footed exercises. Also http://achillesblog.com/agnesatr/ shows a lot of exercises she did in the various stages of recovery. i’m so anxious to get “recovered” and i’m only 3w1d post surgery. i see my ortho today and get stitches out and talk about the next coming weeks. i need a reminder daily that this is a slow recovery with no short cuts. I am probably not confident enough yet to try to fully weigh through…. I have ordered the even up and am eagerly awaiting its arrival in the mail. One thing I have learned from reading everyone’s stories on this site is that you can’t rush this recovery - and just be happy with my daily improvements. For now - I’ll just continue to try to walk around the house with one crutch. If you can’t yet put full weight on your foot then keep using crutches. Also - since your wearing a boot make sure you have an even up on the good foot (or wear shoes to make both feet at the same height). Otherwise you can’t help but walk weird. One thing I read on this site that is definitely true is you have to take tiny steps, at first, in order to walk normally. Yes it is abnormal to do this but your achilles does not have the strength or flexibility yet for you to take long strides. If you can only take teeny-tiny strides with a normal gait then you should probably keep using the crutches. Once you can take somewhat more normal strides. So use the crutches to help you with a normal stride and practice walking normal with small steps without the crutches at home. bdelputte’s AchillesBlog is proudly powered by WordPress and WPDesigner..